So this weekend Popsters I thought it’d be nice to show the dads of the world some love and give ’em all some well deserved props. Mind you, if you’re just another useless sperm donor….keep moving…today’s Pop Bitez (and this particular day of celebration) are not for you. Please, feel free to celebrate your holiday on April 1st. I had a great time putting this collection together for you but I have to admit, as I surfed the net in search of these vids, more than once, I found myself with a basketball sized lump in my throat. By the time you get to number one I’m predicting you’ll all be reaching for the tissues as well. I apologize in advance. 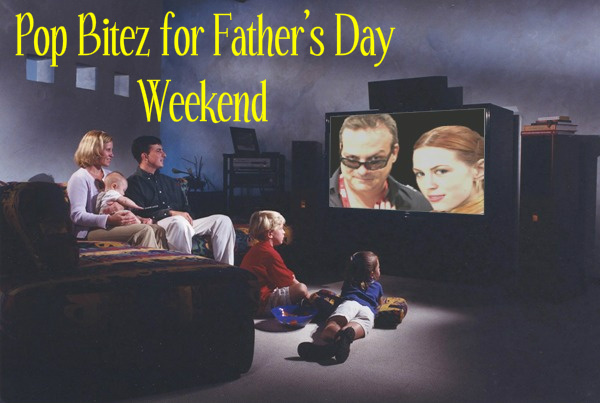 The Pop Bitez Picks for the 10 Best Videos for Father’s Day 2011! In 1989 King Crimson gutarist Adrian Belew, known for his work with The Talking Heads, David Bowie, Frank Zappa and Nine Inch Nails, recorded this cute little duet with his 11 year old daughter Audie. It’s always been a personal fav of mine. Enjoy! In 1970 Bobby Goldsboro climbed the American pop charts with this bit of daddy kitsch. As this “Scotty” was growing up I hated this song. I can’t think of another tune that gave me as much of a complex as this one and, every time it came on the radio, I ran and hid like a Schnauzer on the Fourth of July. Sure, we can laugh about it now but….today I just smile and remember my dad, “Watchin’ Scotty Grow“. This is probably my favorite tune from Andrew Lloyd Webber’s Phantom of the Opera. For those of us mourning the fathers who are no longer with us today, this one is particularly poignant. I told you about this one last week, it’s a sweet little bed time story written by a daddy for his darling and energetic little brat. Can you think of a better choice to record the audio version of this particular book? Yeah, me neither. Talk about your daddy issues. Next to The Great Santini, this has to be the most difficult and conflicted father/ son relationship in cinematic history. I can still feel my jaw hitting the cold cement floor of Showcase Cinemas, a long time ago, in a city far, far away. You were waiting for this one, right? A true classic from one of the most decent people I’ve ever had the pleasure of meeting. I miss ya Harry, you left us too soon. This has got to be the roughest weekend of the year for his son, Josh, don’t ya think? If you haven’t reached for the tissues yet, now would be a good time to grab a few. The lead characters in Disney films are most often orphans or, at the very least, raised by a single parent. Departing from tradition, when the story of Simba begins both of his parents are actually alive. Of course, we all know too well what scene comes after this one, don’t we? Without question, when considering Disney’s 50 animated classics, there has never been a better father/ son moment than this one. To be fair, this video includes both fathers AND mothers. I’ve often heard it said, the hardest part of being a soldier isn’t the dangerous combat, difficult living conditions or lousy food, it’s the long stretches of time spent so far away from their kids. Prepare yourself, there is a monster lump coming to your throat in about 20 seconds.